The Keddy K800 series of stoves (3-9kW) are a modern and contemporary range of stoves that feature ultra stylish and exquisitely made wood burning stoves. Featuring a unique and lovely symmetrical shape, a large door window and side glass windows to give plenty of views of the fire burning controllably in the firebox. Made entirely from cast iron which gives the opportunity to create lovely forms and shapes and uniquely, the door is machine ground to create the seal rather than fitted with rope seals which means there is no need to worry about these wearing out over time. Available with different stand options, clad in soapstone, concrete and finished in grey or black paint finishes gives the choice of 20 different stove permutations. 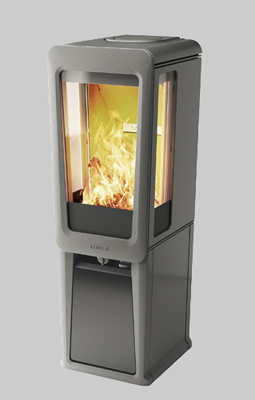 Keddy stoves can be fitted with an electronic self-regulating damper to control the rate of burn which optimises the combustion and prevents overheating. The K800 series offers clean burn performance with 80% efficiency and built in secondary air wash to keep the glass clean. The K800 stoves are a quality built Swedish made stove range and supported by a 20 year guarantee on the cast iron parts.